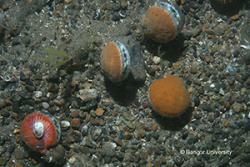 Queen scallops on the seabed in the Isle of Man. Sea fisheries are worth £12 million a year to the Island’s economy, with the product exported all over the world. Bangor University was first appointed to advise the Department of Environment, Food and Agriculture (DEFA) in 2007. The University’s current contact, which ends in August 2015, has been reappointed for a further five years following a tendering exercise. According to the Isle of Man government, the scientific advice provided by Bangor University, is leading to a better understanding of sea fisheries. 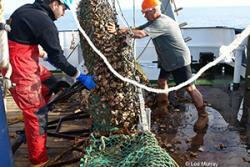 Karen McHarg, Director of Fisheries with DEFA, said Bangor scientists conduct the detailed queen scallop stock assessment and collect data for all the major commercial species, including scallop, crab and lobster. The University advises the Manx Fish Producers’ Organisation and the Queen Scallop Management Board – a body that has membership from all the Irish Sea fishing jurisdictions. Karen said: ‘Two Bangor scientists are based at DEFA, working closely with officers and the fishing community, and this has worked well to integrate the science, Government and industry working relationship. Richard Ronan MHK, Minister for Environment, Food and Agriculture, said: ‘The Department will continue to work in collaboration with Bangor University and the Science Steering Group, a body established last year on the recommendation of the Queen Scallop Management Board.